The Hyundai 2.4L engine (G4KC, G4KE, G4KG, G4KJ) belongs to the Theta/Theta II engine family. It is a 2.4-liter four-cylinder gasoline engine with multi-point or direct injection depends on the generation and in which vehicle it is used. Like other engines, Hyundai shares this power unit with KIA brand. The 2.4L is very similar to the 2.0L version of the same Theta series, with slight differences due to the increased engine displacement and internal loads. The engine has aluminum open-deck cylinder block and aluminum cylinder head. The increased displacement was achieved by installing a new crankshaft with 97 mm stroke (two-liter engine has 86 mm stroke). The cylinder bore is also larger. In this case, the engine got new pistons with a diameter of 88 mm (instead of 86 mm pistons). The cylinder head has 4 valves per cylinder (16 valves total) and double overhead camshafts (DOHC). The crankshaft drives the intake and exhaust camshafts by using a timing chain. The first Theta engines use the continuously variable valve timing (CVVT) for intake timing only. The later generation, Theta II engine, is equipped with the variable valve timing system CVVT on both camshafts. There are not hydraulic lifters/tappets in the valvetrain of the 2.4l engine; it uses shimless bucket lifters (clearance adjustment is required about every 60k miles). Most of Hyundai’s and KIA’s 2.4 engines are equipped with multi-point fuel injection (MFI or MPI). The newest engines, named as 2.4 GDI, have direct injection. That means the fuel is injected directly into each cylinder by special multi-hole direct injectors. The Hyundai 2.4 GDI engines have a high-pressure fuel pump mounted on top of the cylinder, which is actuated via an additional 4-lobe cam on the exhaust camshaft. The Hyundai Theta series took the start as the result of the World Engine program, that is why the 2.4l engine is quite similar to Mitsubishi's 4B12 engine, which, by the way, used not only by Mitsubishi but also in Peugeot and Citroen cars. Engine problems are the same as two-liter engine has. There are different sounds, noises, knocks. You can read more information in the Theta 2.0L engine review. G4KC - 162 hp (121 kW) at 5,800 rpm, 164 ft-lb (220 Nm) at 4,250 rpm. The engine belongs to the first Theta generation. It has 10.5:1 compression ratio. The G4KC engine was used in the Hyundai Sonata NF, KIA Carens, and KIA Magentis. G4KE - 175 hp (131 kW) at 6,000 rpm, 168 ft-lb (228 Nm) at 4,000 rpm. 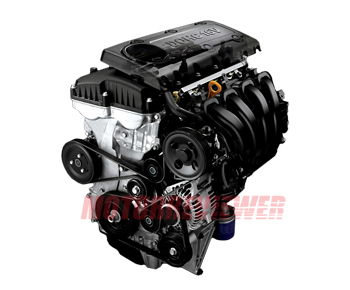 The G4KE is a 2.4L MFI Theta II engine with dual CVVT system and 10.5:1 compression ratio. Application: Hyundai ix35, Hyundai Grandeur, Hyundai Sonata, Hyundai Santa Fe, KIA Forte, KIA Magentis, KIA Sorento, and KIA Sportage. G4KG - this version is identical to the G4KE engine. The G4KG is offered in the KIA Carens available in the USA and Canada. G4KJ - 201 hp (150 kW) at 6,300 rpm, 184 ft-lb (250 Nm) at 4,200 rpm. The G4KJ engine is a 2.4l GDI engine of the Theta II series with direct fuel injection and 11.3:1 compression ratio. Application: Hyundai ix35, Hyundai Grandeur, Hyundai Sonata, KIA Sportage, and KIA Optima.